Contact forms are something that we all have on our sites, but it is something we don’t give much time and attention to. I used to think very little of them until I boosted my conversion rate on NeilPatel.com by 26% just by removing one form field. I know a 26% boost in conversions doesn’t seem too big, but it will impact the site’s revenue well into the six figures each year. For that very reason, I thought it would be fun to create an infographic that not only explains how you can boost your conversions by modifying your form fields, but also shows you the results well-known companies achieved through A/B testing their forms. Are you tired of reading basic information on SEO? I know I am. Every time people tell me about basic SEO tactics like optimizing your meta tags… it drives me crazy. Why? Because there are already thousands of articles on meta descriptions, and there is no need to regurgitate the same old information. 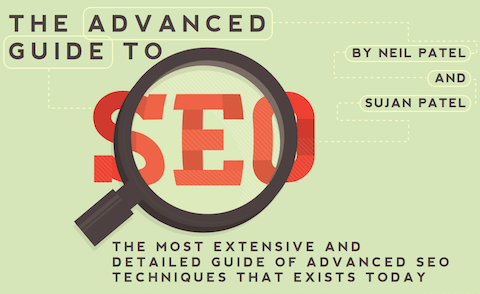 Because of this, I wrote The Advance Guide to SEO. It took me a bit more than six months to complete it… but now it’s live. There is no doubt that SEO has changed a lot over the last twelve months. I remember the days when SEOs, including me, focused their time and energy on boosting keyword rankings. We would track all of our keywords and watch them go up as we built links. Although some SEOs still do this, I myself haven’t tracked my rankings in over a year. Why? Because SEO has turned into a long-tail game. If you are looking to squeeze more dollars out of your existing traffic, you need to start running A/B tests. If you have at least 10,000 monthly visitors, you should consider running one new A/B test every other month, if not once a month. With my business, we typically run one A/B test every two weeks, and although many of the tests fail, we usually find a winner one out every four tests that boosts our conversion rate by at least 20%. One of the main ways I’ve been able to have great success is by learning from other entrepreneurs. Each week, a group of entrepreneurs, including me, discuss A/B tests that we had success or failures with. We share data with each other, which then helps all of us come up with new A/B tests to try.